Report on The City Law School’s Oil and Gas Law Research Group seminar. On the 9th of May 2016, the seminar titled “Legal and Commercial Considerations when Oil Price Falls” was successfully organized by The City Law School’s Oil and Gas Law Research Group (OGLRG). The event was supported by Globe Law and Business Ltd. 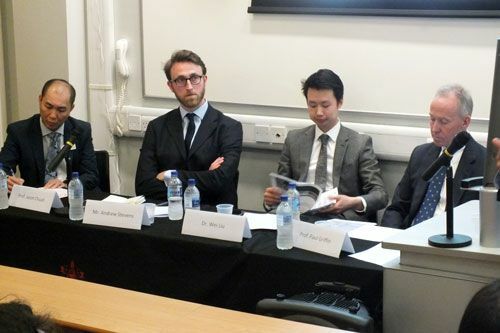 The three distinguished speakers were Mr Andrew Stevens (Barrister, 4 Pump Court Chambers), Professor Paul Griffin (also former partner in City law firms), and Dr Wei Liu (Manager, Infield Systems). The chairman of the event was Professor Jason Chuah. The event was well attended by students as well as business professionals and lawyers from the oil and gas industry. Andrew Stevens gave a presentation on the topic of the termination of oil and gas related contracts. The presentation considered two scenarios involving offshore construction contracts and rig hire contracts. 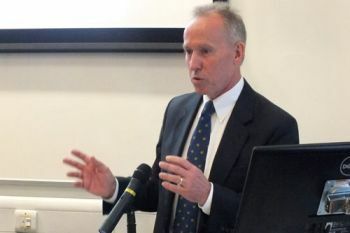 Andrew illustrated the legal framework of such disputes based on his years of practical experience and the specific types of issues now arising during the oil price fall. He also gave an insight into the cultural context of such disputes as he has acted for many Chinese clients. Andrew highlighted a number of important cases which helped the audience to identify key cases and issues likely to have to be determined by the courts in the near future. Dr Liu, along with his colleague Mr. Adrian Dorsch, made a joint presentation on the topic of current market prospects and the practice of upstream supply chain contracts. The presentation was supported by profound industry data to show the current market dynamics, from oil price forecasts to offshore project capex forecasts. In addition to detailed data, the presentation also used quite a few case studies to show cancellations and negotiations in offshore charter contract, newbuild, offshore vessel and rig contract. Professor Griffin talked about contract re-negotiation in the oil and gas industry. Based on some thirty years’ experience in private practice he showed the audience a comprehensive picture of contract re-negotiation, from general framework to specific key provisions. Professor Griffin also emphasized the relational nature of those agreements as well as the impact from culture and geopolitical factors. At the end of his speech, he used some examples to further explain the situation. In the Q&A session, all three speakers received active feedback and questions. The wine reception at the end of the seminar was a further opportunity for all attendees to engage in interactive conversation. The Oil and Gas Law Research Group (OGLRG) is a newly founded research group affiliated with The City Law School. The Group focuses on the commercial legal challenges that the oil and gas industry faces, without losing sight of the legislative, policy and regulatory developments that underpin them. 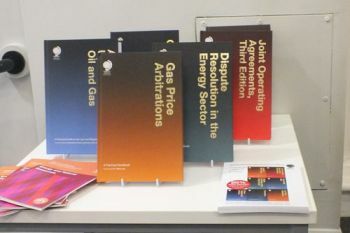 OGLRG, mainly comprising academics and researchers, sets out to establish close cooperation with the industry and law firms in the energy sector. This seminar was the second event held by the OGLRG and more events are expected in the future. The It will soon have its own blog, and can be followed on Facebook and Linkedin. The Supply Chain is the network created among different companies producing, handling and/or distributing a specific product. Specifically, the supply chain encompasses the steps it takes to get a good or service from the supplier to the customer. Supply chain management is a crucial process for many companies, and many companies strive to have the most optimized supply chain because it usually translates to lower costs for the company. Quite often, many people confuse the term logistics with supply chain. In general, logistics refers to the distribution process within the company whereas the supply chain includes multiple companies such as suppliers, manufacturers, and the retailers.